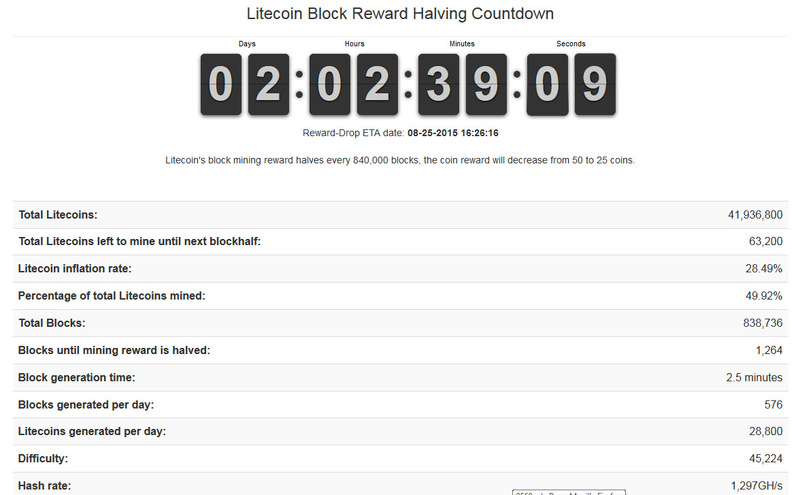 There are just about two more days left before the first Litecoin (LTC) block reward halving occurs, this should happen sometime on Tuesday, August 25th. Litecoin’s block mining reward halves every 840000 blocks or roughly in 4 years, and we are going to see the first halving that will bring the coin reward down to 25 coins from the current reward of 50 coins. The total Litecoins mined when the first block reward halving occurs will be 42 million and for the next 4 years before the next halving occurs there will be 21 millions more LTC mined. The question how will the halving affect Litecoin (LTC) and especially the price of the alternative crypto currency is the one that miners are continuing to be asking as the day approaches. If you want to keep a track of when exactly the Litecoin block reward halving will occur, then you should know that there is a countdown on a dedicated website just for that available. 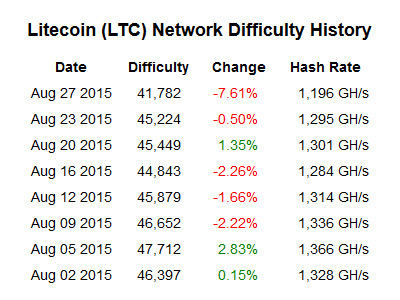 There is just a bit over a week before the first halving of the block reward of Litecoin (LTC) happens. In less than 5000 blocks or sometime on Tuesday, August 25th the block reward for LTC will go down from the current amount of 50 to 25 coins. This is the first block reward halving for Litecoin as the coin in planned to halve the reward every 840000 blocks, so it will not be the last one. If you are a miner you might be worried about the price and profitability of Litecoin (LTC) after the block reward halving occurs, though the Litecoin Association feels “it is critical to mention that the price of Litecoin (while exciting) is not paramount to the goal of what we are trying to achieve as a cryptocurrency”. They have even produced an educational video on it, you can watch the clip embedded in this article. If you are a miner that has invested in hardware and still needs to pay back for the hardware before starting to make profit, then an event such as the halving of the block reward cannot be overlooked. If the price of LTC remains at its current level when the halving occurs it will mean that you will be making half of what you are currently earning mining for Litecoin. This could mean that continuing to mine may not be profitable anymore when you add in the price of the electricity you need to pay for example. As a result of this some miners may stop mining and thus the difficulty will start to go down, or the price could go up and thing may balance out again in a couple of days after the halving occurs. There is no way to actually predict what will happen, but we know that things will balance and the mining and usage of Litecoin will continue after the halving just as it has happened with Bitcoin already. There is still a concern about the future of Litecoin however and it is related to the mining process, as things have moved past GPU mining for LTC and we’ve moved to the ASIC mining period last year things were still progressing well. But we have not seen new ASIC mining hardware and the first generation of miners are already getting obsolete, so fewer miners are still mining LTC and not much new miners are starting to mine LTC (there are other Scrypt coins also). So the block reward halving is actually not a problem for the future of LTC, it is something that should actually help in resolving the issue with mining in one way or another. However as mining becomes more and more unprofitable for normal people mining LTC and only large mining farms remain things may not end up well for the crypto currency in the future if the situation with the lack of new mining hardware remains the same. This is already happening with Bitcoin and if Litecoin follows in its footsteps things may not end up so well with other new alternatives popping up such as Ethereum that can be mined by a regular users with a GPU.